It has happened to most of us. You deleted a file and realize you need it back. But is it really deleted? Find out how to recover those files. If you’re not sure whether you permanently deleted a file, be sure to look around for it first. In Windows, you’ll want to open the Recycle Bin and look for the file. You can search the Recycle Bin using the search box at the top-right corner of the window, which may help if you have a lot of files in your Recycle Bin. You can also right-click in the window, point to Sort By, and select Date Deleted to view files that were recently deleted. However, if it comes to the point where you accidentally formatted your drive and/or want to recover files from your corrupted drive that’s been thrown in your closet (yes ,we all have done that) which is left to gain dust and have no specific reason, as to why you are still keeping it. It’s still possible to get most of your data back from photos to files and even your media folders. Below i have listed the best software for these situations. 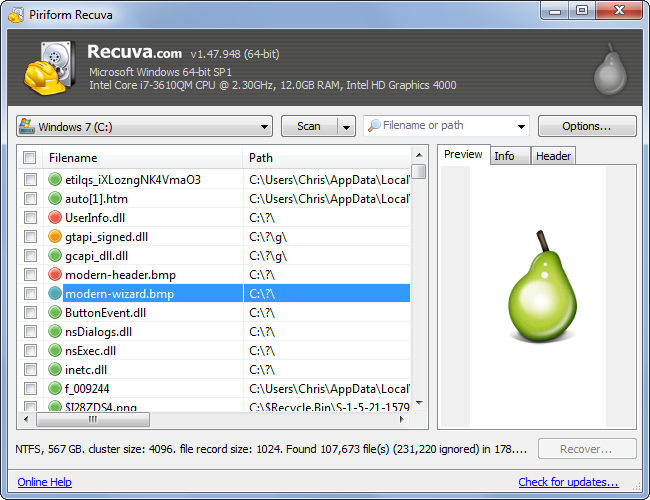 Conveniently available in a portable version, Recuva Free is very easy to use. A wizard asks you what type of files you’re looking for, and where to search, then scans your system at speed (FAT, exFAT and NTFS file systems are supported). Any files found are listed (with previews for images), and you can restore anything you need in a couple of clicks. Running the program in Advanced Mode provides more options, though, like a Deep Scan (much slower, but recovers more files), the ability to locate files containing particular text, and even an option to securely wipe files containing sensitive information, ensuring that no-one else will be able to undelete them.Whatever mode you’re using, Recuva is an excellent recovery tool, effective and very easy to use. The all-in-one recovery software. Total recall has been in the market since 1992 and i have found no problems with them. The fact that they have so many options is a bonus and a must have for any person wanting to retrieve their lost files. From email recovery to CD/DVD , drives and deleted files ,plus its ability to be compatible with MAC OS proves its the best in the market. Here’s what it can do. Accidentally lost or deleted files that haven’t been overwritten with new data can be scanned and recovered with ease with the delete file recovery module. Sometimes these fragile disks get scratched, or won’t mount due to a bad burn. Total Recall can often get your data back on these too! Try it and see for yourself. Scanning speed isn’t great, but Undelete 360 can recover files that other programs miss , and so it’s definitely worth considering. The best way to ensure you’ll never have to recover a deleted file is to perform regular backups. Even just enabling the File History or Windows Backup functionality in your version of Windows will give you some peace of mind. If you store your documents in Dropbox or a similar service or have them backed up to an online location, you’ll also have a backup. All these backup options also allow you to restore previous versions of files. It’s still possible for a file to be deleted, but if you’re performing regular backups, you won’t lose much data. You’ll have much more luck restoring backups than recovering deleted files. Backup services are cheaper than professional data recovery services, too. ← How to check whether your ISP is Throttling your Internet speeds.